Today, in America, we celebrate the declaration of our independence from Britain. If you read the list of wrongs that led those Americans to “dissolve the bands” which tied them to their forebears, and contrast them to what’s happening in Syria today, you can see that in tyranny too, human kind has made real progress. We distract ourselves with a million other things, but distraction doesn’t change reality: thousands have died; thousands more are being held; tyranny still lives. One of our own, Bassel Khartabil, is one of those thousands. 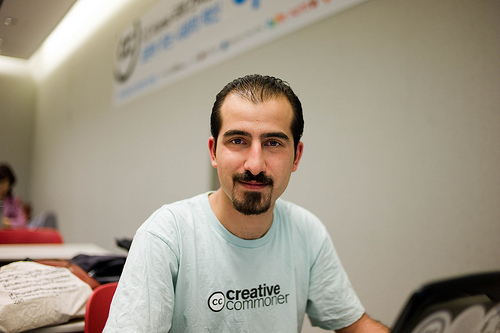 Bassel is a free software engineer. He’s also a Creative Commons volunteer. Three and a half months ago, he was detained by Syrian thugs. We have recently learned that he is being held at the security branch of Kafer Sousa, Damascus. For most in the free software and free culture movements, the worst that ever happens is the sneer from a copyright lawyer. But in the middle east, the fight for freedom is generic: To stand for the right to create and share freely is to risk the most extreme response. Bassel is now suffering that most extreme response. There are a thousand ways you can help the people of Syria. Here is one more: On this day of independence, stand with this one free soul. There’s a site, a Facebook page, and a hashtag: #FREEBASSEL. Use and share them all. No doubt, puny stuff compared with Syrian brutality. But with the thousands who have Bassel in their prayers, let it be the beginning necessary to get the world to resolve to end this brutality. Now. Lawrence Lessig is the Director of the Edmond J. Safra Foundation Center for Ethics at Harvard University, and a Professor of Law at Harvard Law School. Lessig serves on the boards of Creative Commons, MAPLight, Brave New Film Foundation, Change Congress, The American Academy, Berlin, Freedom House and iCommons.org. He is on the advisory board of the Sunlight Foundation. He has previously served on the boards of the Free Software Foundation, the Software Freedom Law Center, Electronic Frontier Foundation, the Public Library of Science, Free Press, and Public Knowledge. Lessig was also a columnist for Wired, Red Herring, and the Industry Standard. Greenhost supports the call for Press Freedom on the Nets. The last two years we worked closely together with our partner Free Press Unlimited to spread free media and limit online censorship. Together with Hivos and Dutch accesprovider XS4ALL we initiated the Protection Lab; a new organization to educate, train and work on topics of webfreedom, protection for journalists, secure communication and infrastructure for a free flow of information. Together we hope to provide a strong and secure platform for journalists from all over the world. Fighting for Liberty has come of age, the right to speak ones mind should not be compromised in the society.Basel Khartabil, a free software engineer should be given a listening ear instead of been detained by the Syrian thugs. The Syrian Government should be able to respond positively to the agitation,pleas and reaction of the Civil society around the world clamoring for the release of the The Creative Common Volunteer.